The last few months from mid-May were spent giving our garden a facelift, trimming off excess fat so to speak. Hmm…still can’t get used to its slim look but what must be done has to be done! Comparing the delightful scenes above, you’d noticed that most of the hanging pots of orchids and spider plants at the roof’s eave were removed. The Tricolor Dracaena on the left and the White Mussaenda tree on the right were shooting skywards unrestrained and have to be cut back too. 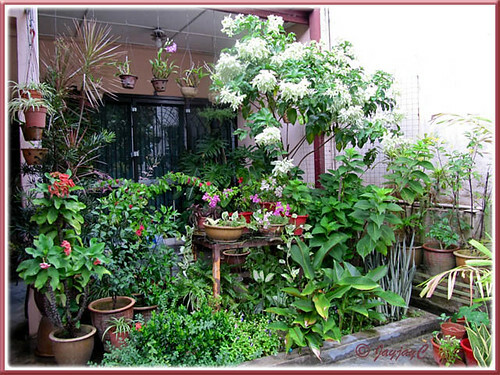 Some pots were reshuffled to other positions and a great number of potted plants, especially housed in large pots were disposed or given away. All in all, the aim is to cut down the number of our plants which can be heartbreaking. This tedious task is gradual and on-going as it’s not only difficult to make choices on which goes and which stays but we have to be very careful in not injuring our aged backs in the process. The decision to reduce our plants is because my beloved John has been diagnosed with having lumbar spondylosis (multi-level degenerative discs) and have been advised to avoid carrying heavy loads and reduce garden activity of bending and lifting. I, on the other hand have osteopenia, though not threatening but best to be cautious too. Meanwhile, these are some of our garden pictures taken during the last two months of June and July. Enjoy! This section always gives us a sense of joy and satisfaction. 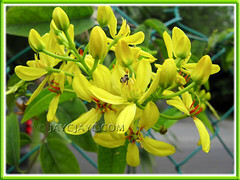 At any one time, there are at least a couple of plants flowering. 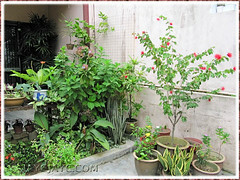 Even if not blossoming, the lush greenery itself is calming and therapeutic. 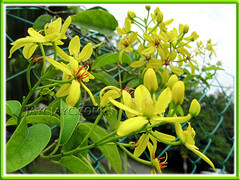 Lo and behold, two to three months later, it presented us with some strikingly beautiful golden clusters! Though the flower bunches weren’t many but enough to make us so happy! Thank you, my pretty lady! 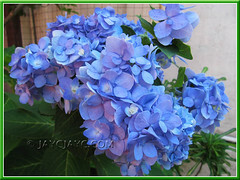 Hydrangea macrophylla (Mophead/Bigleaf/French Hydrangea, Hortensia) – this blue beauty never fails to uplift our spirits. We enjoy watching it gradually changing the colour of its dress from blue to a darker shade of pink as it ages. 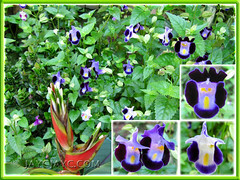 Torenia fournieri – these are such happy-go-lucky annuals that self-seed so readily to please us. We just love these plant fillers, so do the mealy bugs! So watch out for those tiny ‘moisture-sucking’ pests! 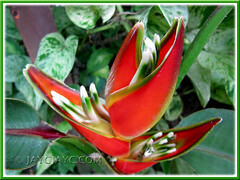 Heliconia stricta ‘Carli’s Sharonii’ – a very hardy and reliable beauty that doesn’t tire producing spectacular and long-lasting blooms, endlessly year round. 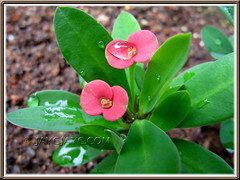 Euphorbia milii ‘Red Dwarf’ (Crown of Thorns), a dwarf cultivar with tiny red flowers, 1-1.5cm across. Its parent succumbed to mealy bug attack but we managed to salvage 2 young shoots – just 10cm-tall but flowered for the first time in May and has been blooming almost non-stop ever since. Amazing! 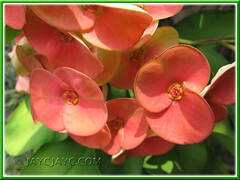 Euphorbia milii (Crown of Thorns) with deep orange-red bracts. This is the standard variety and bloom colour will gradually lighten to salmon as it ages. I’m sorry to note the health ailments both of you are facing. That explains a lot when you reduce your garden for easy management. It sure very difficult to decide which ones to keep and which ones that stays. 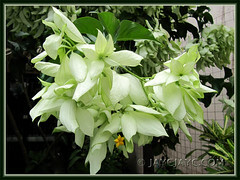 Have given away your orchids?? You have a beautiful Hydrangeas and the Golden climbers. They are so pretty that makes the heart rich. Hope both of you get better. Thanks for your kind and comforting thoughts, James! John and I appreciate them very much. 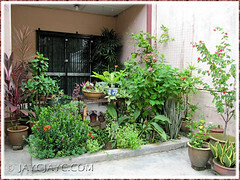 Re orchids, we reduced the number…repotted only the healthier ones and hanged some on a waist-height flowering stand, while the rest on the wire netting just below the Passiflora Vine on the right-sided wall. 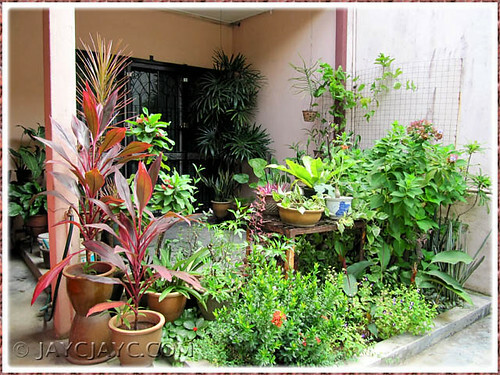 Do you know what is the name of the 2 potted red-leaved plants in the first picture? 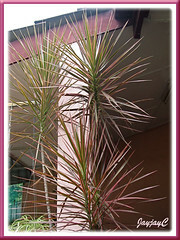 They’re known as Cordyline terminalis (Hawaiian Ti or Ti Plant). Do click on the link to know more if you’re interested. Thanks for your well wishes and advice, dear friend! I took some photos of flowers this morning and was searching for their names. I found them both here; rangoon creepers and scarlet passion flowers. Thanks for the answers. Great site! May you and your spouse get healthier each day. Delighted to know you’ve nailed their ID! Thanks for your compliment and well wishes…they’re much appreciated!